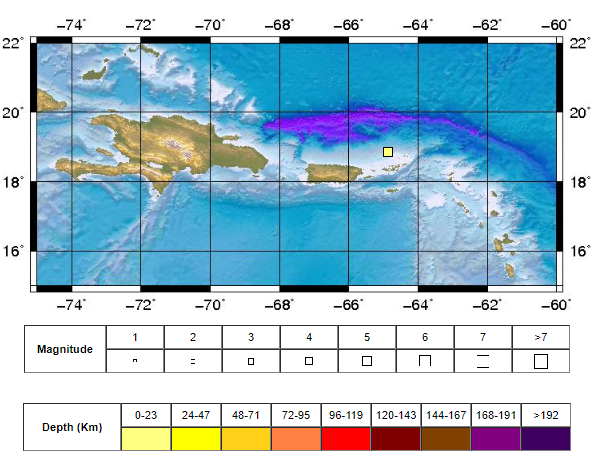 A relatively small earthquake was recently felt in sections of the British Virgin Islands. The 4.3 magnitude tremor happened minutes after 12 o’clock Wednesday morning, according to the Puerto Rico Seismic Network. It was located about 57.56 kilometres northwest of Road Town, Tortola. “The Department of Disaster Management (DDM) takes this time to remind the BVI community that we live in a seismically active zone, which makes the territory vulnerable to earthquakes,” the DDM has said. Residents are advised to remain calm during an earthquake. Persons who are are indoors during a tremor are advised to stay there and move away from objects that may fall such as ceiling fans, glass windows and doors. Experts advise that persons indoors get under a desk or sturdy piece of furniture, cover their head and hold on. If outdoors, persons are advised to move into an open area away from trees, building, or utility wires and poles. Is it just me, or are we getting a lot of earthquakes recently?